No trip to Delhi is complete without a visit to Jantar Mantar. Representing the scientific advancement of ancient India, Jantar Mantar, a colloquial term of words yantra and mantra, which means instruments and formulae respectively, is one of the five observatories that were constructed by Maharaja Jai Singh of Jaipur in 1724. Maharaja Sawai Jai Singh for his knowledge of astronomy and steps for the betterment of masses by abolishing practices such as sati, is considered to be one the most enlightened rulers of India. Other observatories were built in Ujjain, Jaipur, Varanasi and Mathura. The observatories in Ujjain, Jaipur and Varanasi are still functional. Jantar Mantar Delhi was built with purpose of providing accurate astronomical data Maharaja had found that the then present astronomical instruments were quite small, and hence couldn’t make correct observations. The observatory, Jantar Mantar was active for 7 years, when everyday data was collected, calculated and then given to the ruling emperor. However, due to construction of tall buildings around it, it no longer provides the correct calculations. 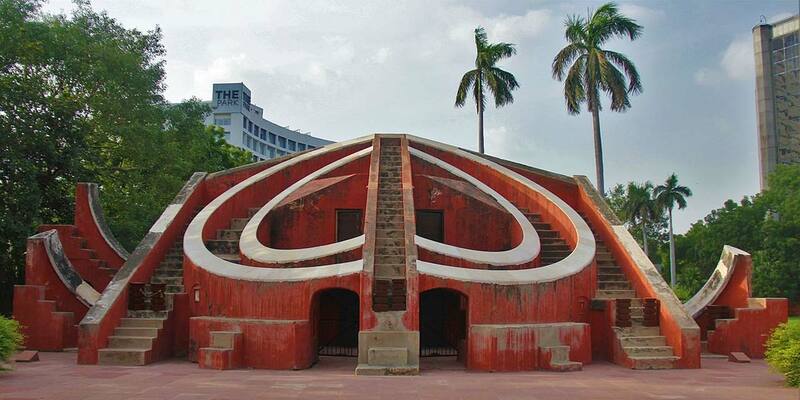 Jantar Mantar Delhi consists of thirteen architectural astronomy instruments. The most noticeable of them are Ram Yantra, Mishra Yantra, Samrat Yantra and Jai Prakash Yantra. Samrat Yantra, which is the sundial, is one of the most captivating of the observatories is an impressive yellow structure with a long arm of 27 m built at an angle of 27 degrees. It was used to measure the time of the day. Another instrument of the observatory which was used to measure the longest and the shortest day of the year is Mishra Yantra. It consists of two pillars. The other instruments at the Jantar Mantar observatory were used to calculate various phenomena of planets, stars and the universe. The opening time of Jantar Mantar is 6 AM and the closing time is 6 PM. It is open on all days of the week. The Jantar Mantar entry fee is Rs.15 per person for Indian visitors while for foreign tourists, the ticket price is Rs.200 per person. The entry fee for SAARC and BIMSTEC visitors is Rs.15 per person. Jantar Mantar is located in the heart of Delhi city, hence it is easily accessible by road and metro rail. The nearest metro station to Jantar mantar is Patel Chowk. Tourists can also take local city buses as well as auto-rickshaws and taxis to reach here. Jantar Mantar is located on the Sansad Marg in Connaught Place, New Delhi.